Love was in the air at LifeTime on Friday when they hosted their first Valentine Tea Party. Over 40 people enjoyed tea and cake, quizzes and fun at LifeTime at the Gateway on Sankey Street – there was even a comedian! 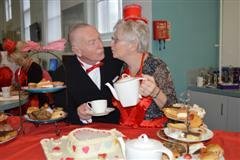 Volunteers really got into the valentine theme, they made aprons for guests and staff to wear and some even made cakes for other members to enjoy and some of the gentlemen impressed with their James Bond look for the occasion. LifeTime was set up to give older people the opportunity to keep active, join in and keep learning and most of all to have fun and they certainly are doing that with everything from A to Z, that’s art to Zumba and everything in between! Love for LifeTime is growing stronger every day!